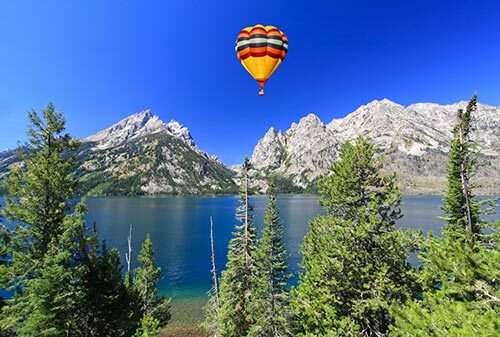 Fly over the largest remaining private open space in Jackson, Hole, a working ranch bordered by Grand Teton National Park, the Bridger-Teton National Forest and the Snake River. The Teton Mountain Range rises five thousand feet right from launch without foothills. You will have commanding views of Jackson Hole Mountain Ski Resort and Teton Village, all of Jackson and seven mountain ranges, including the Yellowstone Plateau. The flight lasts about an hour, with each flight being custom tailored to the weather conditions of the day. You will soar from fifteen hundred to over four thousand feet, depending on conditions, but whether a mile or millimeter above the meadow, that lighter than air feeling stays with you long after the gentle landing where a complimentary mimosa awaits! This is a memory that will last a lifetime. Age and weight restrictions do apply. 12 and 16 passenger baskets. 7 day cancellation policy. Next they’ll introduce you to their larger caliber handguns and rifles. Each shooter will fire approximately 3 – 5 rounds with many of the following firearms. Many more not listed above! Please contact JH Concierge for more information and pricing on these additional activities.